Why do you take your taxes to an accountant? The Answer to why is? EXPERTISE. You know you want an experienced person in their field who has dealt with and knows the ins and outs of law or finance to handle these services for you. These individuals are skilled in their fields and have the knowledge to make the right decisions and have earned your trust in doing so. You also rely on them for advice to make the best decision ensuring you are not spending more than you should ~ actually saving you money and providing secure and sound guidance. If you outsource taxes and contracts to ensure the best result what do you do for your cost saving solutions when it comes to your telecom and utility bills? Every company and organization has the potential to audit their billings, re-negotiate their own telecom and utility contracts and get some form of respectable savings. The same is true of doing your own taxes and reviewing your own contracts … right? But now I ask a hard question? 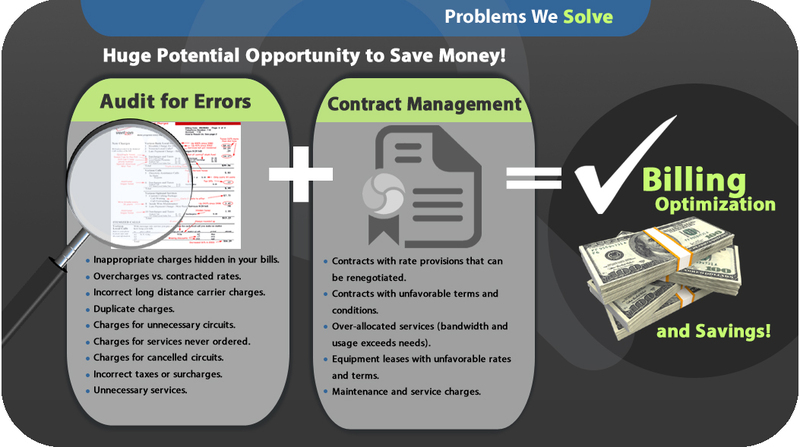 Do the individuals which perform those tasks, who are you entrusting with telecom and utility bill expenses, have the appropriate expertise about telecom and utility billing platforms and contractual nuances??? And are your profits leaking over the years because of this lack of expertise? Check the amount owed is correct. Look for services you no longer have and are still paying. Technology that has changed that may help in reducing costs. Third party charges that you are unaware of. Multiple location charges that are incorrect. Telecom bills are large (delivered in large boxes or multiple CDs), difficult to read, and often not electronic. Telecom vendors (local, long distance, etc.) do not have uniform formats for billing information. Correlating consumption (number of minutes used, etc.) to the bill is often difficult. Forecasting the organization’s future usage is difficult. Trunks and other services must often be ordered in advance, based on an estimate of future need. Internal expertise, especially for the newest available telecom offerings, may be lacking. Fear of change hampers some initiatives that, if implemented, could reduce expenses. Telecom regulations, while simpler than in the past, are still complex (certainly for the United States and increasingly for the rest of the world). For example, some organizations, such as airlines, are exempt from the U.S. Federal Excise Tax for telecommunications. Voice, data, and video integration continue. The billing infrastructure for these three media has traditionally been different (fixed months versus per minute, etc.). As some per-minute costs get merged into packet-based, flat- fee services, confusion over billing will undoubtedly surface. The telecommunications environment is dynamic. Technologies, carriers, offerings, and pricing changes are almost constant. A study done in 2010 may not apply in 2013. Do you feel that this individual in your company has the time and resources to do the best job possible to review, analyze, make adjustments, and check contracts and contact vendors to question errors? Most individuals in any professional position are overwhelmed with everyday tasks, and their responsibilities are usually a vast number of job duties. Those duties may be crucial to the growth of the company and need more focused attention than finding errors and savings in billing(s). Companies do their best to review billing and make the best judgment, but in most cases the maximum savings and potential credits are not met when a company relies on “in-house audits” to be continually performed. So ask yourself “are you saving or are you overpaying”? If you are not professionally auditing bills you are losing money EVERY DAY adding up to $1,000’s and in some cases millions of dollars in savings and credits. Anyone can lower your costs by making a few simple changes, but only an experienced auditor can truly find the MOST SAVINGS. If you have questions regarding your specific telecom and utility savings, contact LT~CRS.